. . . At about noon the skirmishers began to fire & kept it up till about 3 in the afternoon, when the fight commenced in earnest. Our Reg’t was not engaged until 5 o’clock when the line in front were driven back. They went to our rear & then came the tug of war for us & it came in earnest too. Such roars of musketry I never heard although I thought I had heard it before when it sounded musical to some extent & the artillery above all this. On they came and we were forced to retreat. Just as the retreat commenced I stopped & layed down. I had a hole through my right breast. The ball entered my breast & passed through my lung came out just below my shoulder blade. I bled dreadfully. The blood completely soaked my clothes & I also bled inside a good deal but as narrow as my escape was I have lived through it. 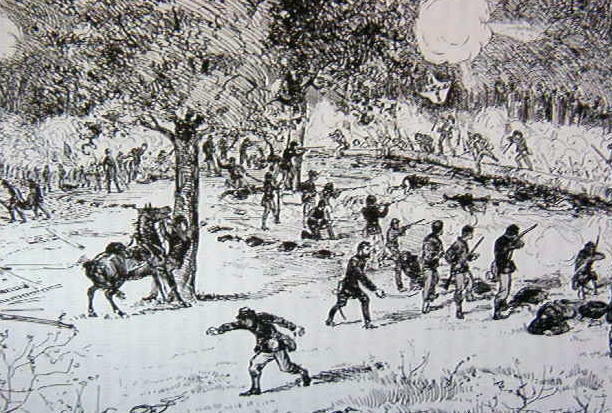 The Reg’t was on the retreat when I was wounded, & in two minutes the Rebels were about me & as they advanced our artillery from the hills opened on them with grape and canister, which was scattered all around where I lay covered me with dirt & mowing the foe down in great numbers & killing some of our wounded left in the field. The fight lasted till night then stopped when two of the Rebels came to me & helped me back to the woods close by where I was left till the next day afternoon. I was in great pain all night. It was with difficulty I could breath at all & did not know I should live to see morning again & at time was in so much distress I almost wished I were dead, but got through the night & the next day did not feel quite so bad. In the afternoon I was taken & carried to a house close by where were 275 of our wounded men & I asked our Dr. who was taken also what he thought of my wound & his reply was that I might possibly get over it. But he could do nothing for it. He told me to keep it wet with water & I tore one of pockets out of my pants & cut it in two, & put one piece on my breast & one on my back. I kept it wet all the time. . . . The first week at the house I layed out on the ground, after that got into an old hovel and stayed there. For the first week they buried from 8 to 15 each day, after that not so many. Our living was very poor but we made out to live some of us at least.
. . . [O]ne morning there came 30 or 40 baggage wagons & they piled us in & drove off. Such groaning as that I should not hear again. They drove us in wagons with no springs for 5 miles over a corduroy road of the roughest kind, then we were loaded off into the cars, what of us were not put on top. Just as we got ready to start it began to rain & blow, which it did for the next hours in earnest & wet me nicely I being outside. At night we arrived at the city of Richmond. That night & till noon the next day stayed in the depot, then were taken to an old tobacco factory in which we stayed a week peeking through the grates in the windows & lying on the nasty floor. There were 800 sick & wounded prisoners in that building & we had to live on rather short allowance I tell you. . . .
Barker was lucky that his stay at the notorious Libby Prison (the “old tobacco factory”) was short. He was part of one of the first prisoner exchanges of the war and returned North after only one week. 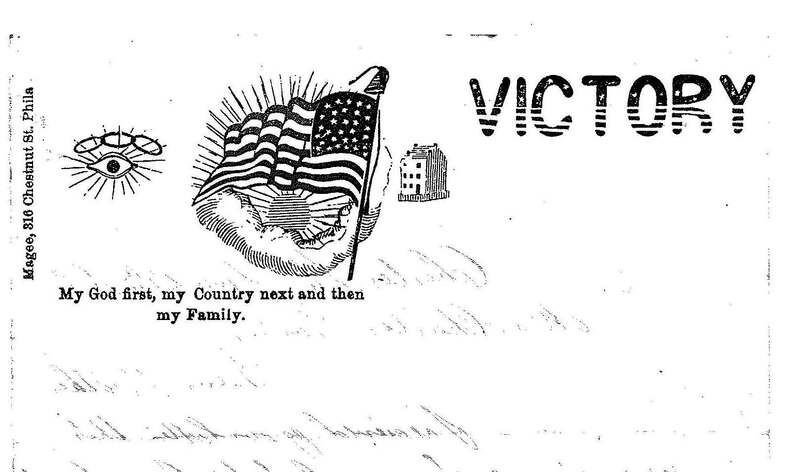 He closed his letter to his sister, written from a Pennsylvania military hospital, with the report that “[t]he Dr. examined me this morning & says he thinks my lung will soon be nearly as good as ever.” The doctor was right: John Barker was back with his regiment for the Battle of Gettysburg, was injured again, and returned to Hanson. He married and became a shoemaker, dying in 1903. His name appears on Hanson’s Civil War monument. I suppose that the girls have begun their school. I would wright them but I have only one stamp and the letters will not go without them now. I should like to have you send me some if you have them for they cannot be got hear for love nor monney. Barker apologized for his poor writing materials when writing from camp (“Do not know as you can read this for it is poorly written and my pencil is short”) while in a later letter from a military hospital in Pennsylvania, he remarked upon the quality of his stationery (“I must stop now for I have filled this great white sheet of paper”). 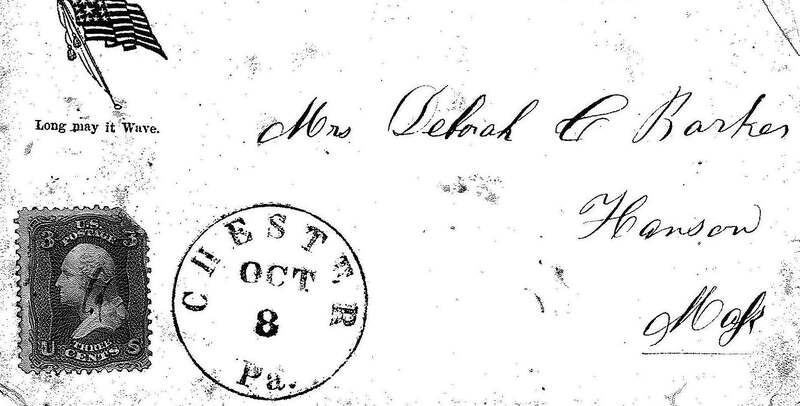 A first-class stamp for a letter sent east of the Mississippi cost three cents. 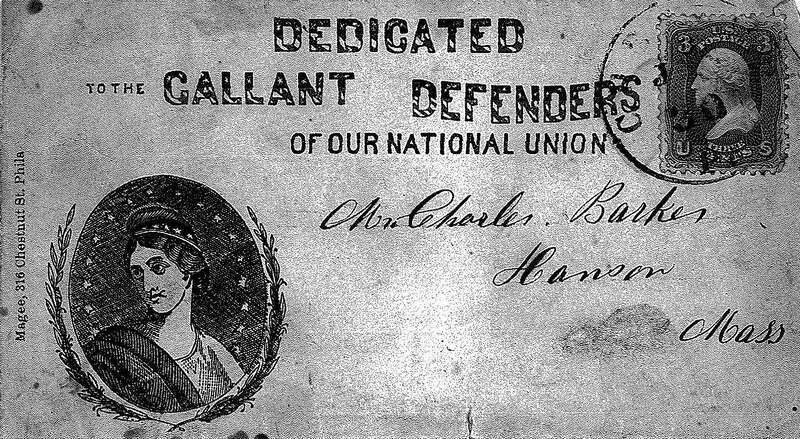 The 3¢ stamp with Washington’s profile used on Barker’s envelopes was issued after Fort Sumter and used throughout the war. Interestingly, Barker did for a period of time have the opportunity of sending letters without buying stamps. He served in the Massachusetts 22nd Regiment, which was organized by Henry Wilson, then a sitting United States Senator from Massachusetts (and later Vice President under President Ulysses S. Grant). 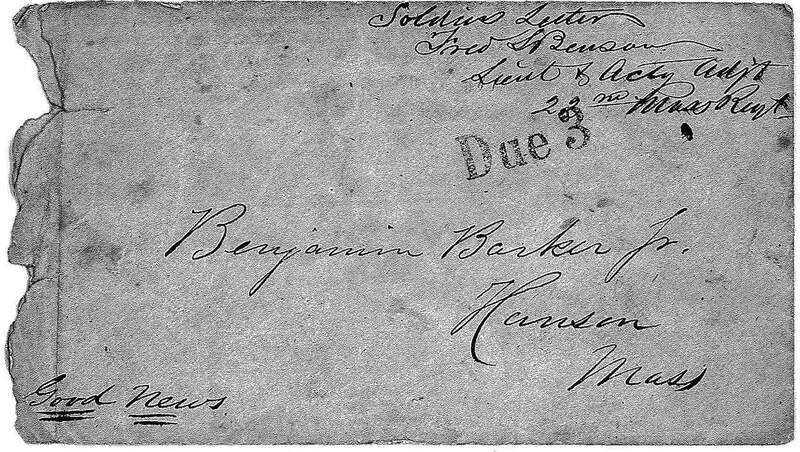 Barker’s first letter home, from training camp at Hall’s Hill, Virginia, has no stamp. 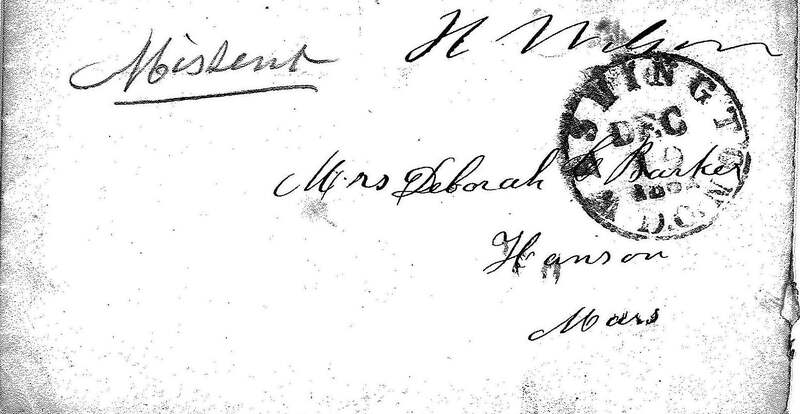 Instead it was “franked,” i.e., Henry Wilson’s signature appears in the upper right hand corner in place of a stamp. Union military officers did not ordinarily enjoy franking privileges; presumably, Barker was able to send some early letters without postage because his commanding officer was a sitting member of Congress.